Tab height 4", 6 tabs per 40". Side hem 1",bottom hem 3-1/8" (8 cm). Measure the drop from the top of pole. If rod length 100", add at least 1.25x fullness for folds and overlap, then order 2 panels of each 63" wide. It works for rod or pole. The height of tab and rod pocket is 4"; width of individual tab is 2". 6 tabs per 40" (100 cm) width. 8 Tabs for 50" width, 10 tabs for 72" width, 12 tab for 84"W, 15 tabs for 100"W.
Top hem 1-1/2", side hem 1", bottom hem 3-1/8". If rod length 100", add 2x fullness for folds and overlap, then order 2 panels of each 100" wide. Pocket height 3.25"(8 cm) plus 1"(2.5 cm) top flange in default. You also may ask for without top flange. Side hem 1", bottom hem 3-1/8" (8 cm). If rod length 100", add 1.5x fullness for folds and overlap, then order 2 panels of each 75" wide. Inside diameter of grommet 1.6", outside diameter of grommet is 2.25". 6 grommets for 42" wide, 8 for 50"W, 10 for 72"W, 12 for 84"W, 14 for 100"W, 16 for 120"W, 22 for 150"W, 26 for 180" and 28 for 200" finished curtain width. Side hem 1" , bottom hem 4". 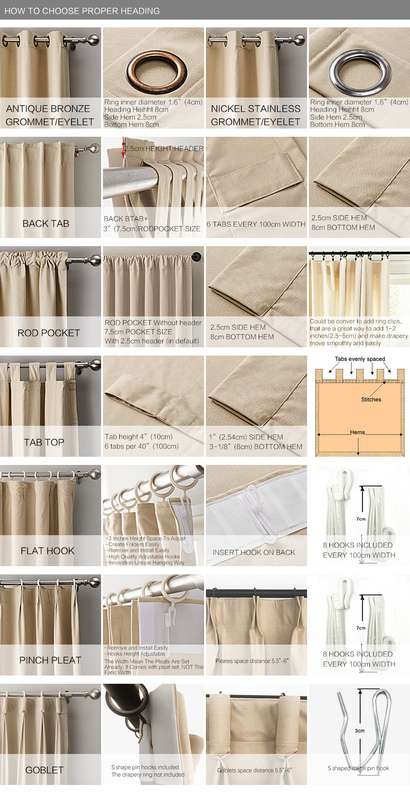 Measure the drop from the top of pole or rod to where you want curtain to finish. It works for rod or pole. Eyelet headings are not suitable for curtain tracks, bay windows. Aluminum grommet is for outdoor curtains for rustproof. Pleat height 3.5 inches. Pleats space apart 5.5-6.5 inches. Pin hooks height adjustable within 3". Pin hook has a ratchet system to make them adjustable. Pin hooks included, but drapery rod rings are not included. Pleats pin hooks quantity: 9 pleats for 50" width; 13 pleats for 72" width; 15 pleats for 84" width; 19 pleats for 100" width; 21 pleats for 110" width, 23 pleats for 120" width, 29 for 150" width, 35 for 180" width and 37 for 200" width. Panel width is the width that pleats already set. 1.8X fabric usage in default to create pleats and folds. Side hem 1", bottom hem 4". Measure length from the eye ring where the curtain hooks attached. If rod or track length is 100", add 1.1x fullness or additional 4" width for overlap and gap privacy, then order 1 panel of 110" or 2 panels of each 55" wide. It works for traverse rod, rod with rings or track. Pinch Pleats can often require more widths of fabric for a given track/pole width so pinch pleat curtains can be quite a bit more expensive than other headings. Pinch pleats are more gathered than other headings and have permanent sewn-in pleats for a more luxurious, tailored look. We use a fully adjustable sliding plastic curtain hook for ease of use. Please note that the size and spacing of the pleats will vary slightly from the picture depending on your track or pole width. Goblet height 3.5"(9cm). Side hem 1" (2.54cm), bottom hem 3-1/8" (8cm). Goblets and metal S shaped pin hooks quantity: 9 goblets for 50" width, 13 for 72" width, 15 for 84", 19 for 100" width, 23 for 120" width, 31 for 150" width, 35 for 180" width and 37 for 200" width. Panel width are the width that goblets already set. 2x fabric usages in default to create goblet and folds. If rod or track length 100", add 1.1x fullness or additional 4" width for overlap and gap privacy, then order 1 panel of 110" or 2 panels of each 55" wide. Pin hooks height 3", adjustable height up and down. 6 pin hooks included per 40" width. Measure length from the eye ring to bottom. rod rings not included., which need to purchased separately. If rod length is 100", suggest to add 1.5x fullness for folds and overlap, then order 2 panels of each 75" wide. It works for curtain clip with rings.